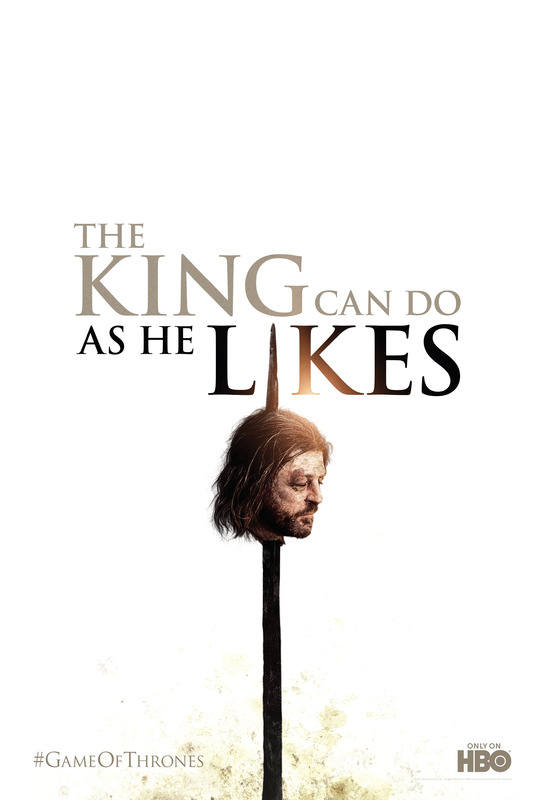 'The King Can Do As He Likes' Image courtesy and © HBO. The latest fan poster for Game of Thrones‘ upcoming second season featuring Ned Stark’s head of a spike, has caused controversy in some internet circles, not for its bloody depiction, but for revealing that one time fan favorite Ned Stark (Sean Bean) is in fact dead. This says two things to us here at Chevron One. First, Ned Stark was one hell of a character to be missed so passionately by so many, and secondly, a small handful of people out there really ought to get up to speed on season one before April 1st if Ned’s death comes as a shock. On another note – did you know that Game of Thrones will have a booth (#438) at the upcoming WonderCon in Anaheim this weekend (March 16-18)? Fans will learn that “Contradicting a King is a dangerous thing” and can celebrate the return of the series with a free photo of your OWN head on a spike. HBO will have a photographer and FX artist that will “behead” them and upload the image to the Official Game of Thrones Facebook page. Now who could say no to that? Game of Thrones season 2 starts April 1st. Don’t be a fool by missing it. just can’t wait enough for season 2….. april shuld come very soon…. I can’t wait for someone to beat the crap out of Joffrey!